How do I support a mentally healthy workplace? The first (and most effective!) 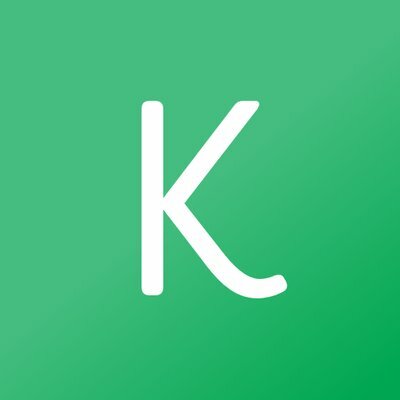 step to supporting your employees’ mental health is to offer a therapy benefit through Kip. You may also want to review your company policies to make sure that employees have the support they need to attend therapy sessions. Let employees shift their schedule so that they can make therapy appointments during work hours. For instance, an employee can get to work an hour earlier to make up for time away during the day. One unique thing about therapy is that it’s often easy to plan ahead: usually, sessions happen at the same time and day once a week, two weeks, or month. So it’s possible to find a time that works well for employees with minimal disturbance to your team. If you adopt this policy, it’s important to let employees know who they can talk to in order to set up a flexible arrangement. Incorporate mental wellness into your sick leave or paid time off policy. Call out that it’s acceptable to use leave for mental health days or therapy. You can also give employees an additional day of paid time off that they’re supposed to use for wellness activities including therapy. “Hey Madalyn, I just wanted to personally thank you for sending emails like this," he wrote. 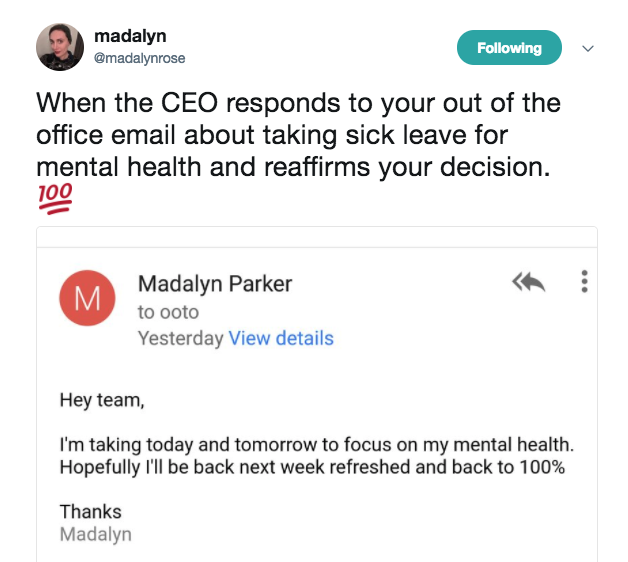 "Every time you do, I use it as a reminder of the importance of using sick days for mental health–I can't believe this is not standard practice at all organisations. You are an example to us all, and help cut through the stigma so we can bring our whole selves to work." Encourage employees to use the benefit by taking advantage of it yourself. Talk openly about your experiences going to therapy and how it’s helped you personally and professionally. A common strategy used by mental health advocates is to list ‘Therapy’ on their company calendar. This normalizes going to therapy and helps employees know that they can find time in their schedule to take care of themselves, too. Not sure what kind of policy is right for your team? Experiment. Let your team know that you want to make it easier for them to access mental health care, so you're experimenting with a policy change that makes it easier for them to do that. Then you can more easily modify the policy as you figure out what works best for your company. …because we know that sometimes, a full therapy benefit isn’t an option quite yet. Kip workshops: We offer one-time, customized workshops for your teams on any topic of your choosing. Examples include burnout prevention, mindfulness, cognitive bias, or effective communication. Headspace: Meditation has been proven to benefit mental wellness, and this is one of our favorite apps to practice mindfulness. Mind Share Partners: Their interactive workshops equip managers and colleagues to build safe spaces, facilitate hard conversations, and learn how to navigate and normalize mental health at work.